Everyone's favourite carrot cake with the added flavours of orange and ginger. Grease and flour 2 (9-inch) round pans. Prepare cake batter as directed on package. Add dry pudding mix; beat 2 min. Stir in carrots, 1/2 cup nuts, ginger and orange zest. Pour into prepared pans. Bake 30 to 35 min. or until toothpick inserted in centres comes out clean. Cool cakes in pans 10 min. Remove to wire racks; cool completely. Beat cream cheese and icing sugar in large bowl with mixer until blended. Whisk in Cool Whip. Stack cake layers on plate, filling with 3/4 cup cream cheese frosting. Use remaining frosting to frost top and side of cake. Place coloured sugar in large resealable plastic bag. Add marshmallow halves, in batches; close bag, then shake gently to evenly coat cut sides of marshmallows. 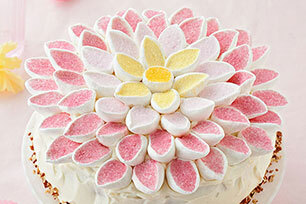 Arrange marshmallows on cake as shown in photo. Press remaining nuts into frosting around bottom edge of cake. Prepare using any colour of sugar. Or, be creative and use a variety of colours. This delicious twist on carrot cake is sure to please. And since it makes 16 servings, it's the perfect dessert to serve at your next party.